Eaves Wood (aka ‘our back yard’) is accessible any time of year. We have visited the woods in snow, fog and glorious sunshine. We have picked beech nuts, played with dogs in the snow, spotted deer, watched small birds flitting through the beech trees and discovered myriad fungi and lichen in this compact little enclave. 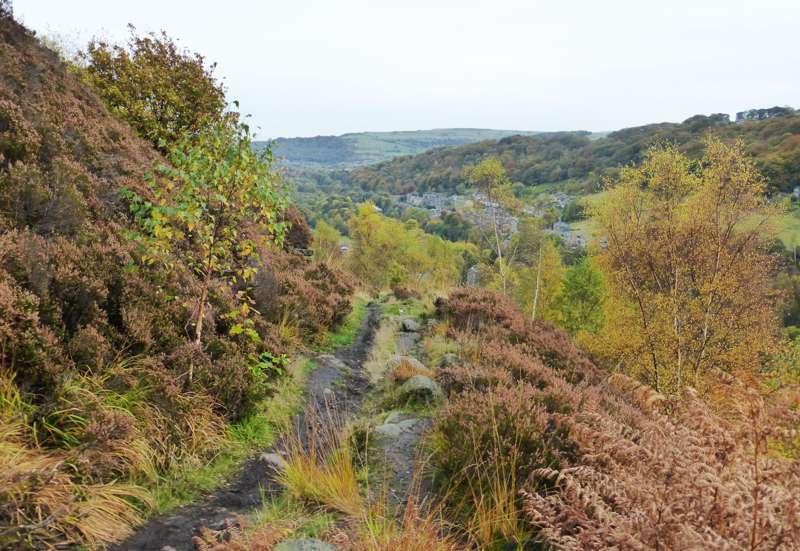 A ten-minute walk up the Cuckoo Steps, which start on the north side of Market Street if you are approaching from the centre of Hebden Bridge, and turning right up Heptonstall Road takes us onto a signed footpath and into the wood. The initial ascent can feel arduous, but it is always worth the effort to reach the gorgeous path at the top along the ridge. The views back down are always rewarding, with the hamlet of Mytholm immediately below. The canal, road and rail lines turn the valley bottom into a train set, complete with dinky toys. We wander around here for hours, exploring the seemingly natural landscape – actually the result of a Victorian job creation scheme! Sometimes we descend into Colden Clough via Lumb Bank – once owned by Ted Hughes – or continue up to Hell Hole Rock. More climbing up steep steps brings wider valley views across to Stoodley Pike. From here, we can follow the path along into a neglected but interesting section of the wood, or continue upwards to Heptonstall village. One of the oldest known settlements in the area, the village's name derives from the Norse ‘Wild Rose Farmstead’. Old streets and buildings bear Nordic names such as West Laithe. The cloth hall, built in 1545 remained the most important in the district until superseded by Halifax Piece Hall in 1779. The old school (now a museum), the ruins of Thomas A Becket church and atmospheric graveyard, provide further clues to a colourful past. The octagonal Methodist chapel is a non-conformist gem, tucked up on Northgate and reached via a small flight of steps. To finish off, we might visit one of the two local hostelries: both The Cross Inn and The White Lion provide food, decent ale, beer gardens and more history.